RIO DE JANEIRO, BRAZIL - AUGUST 9, 2016: Judokas Sergiu Toma (L) of the United Arab Emirates and Khasan Khalmurzayev of Russia seen during their men's -81kg judo semifinal at the Rio 2016 Summer Olympic Games, at Carioca Arena 2. Russian judo has taken a great leap forward over the last eight years. And it is not only Vladimir Putin, the chief patron, who has made this possible. Russian judokas, along with Russian fencers, are among the top medal winners at the Rio Olympics. During the initial days of the Games, the Russian anthem was heard mostly under the vaults of Carioca Arena 2. Beslan Mudranov, who won the gold medal in the under 60kg category, set the tone for the Russian athletes. Three days later Hasan Khalmurzayev won gold in the under 81kg category. The victory of Russia's male judokas, particularly after their performance at the London Olympics in 2012, has not come as a surprise. The London Games produced three Russian champions: Arsen Galstyan, Mansur Isaev and Tagir Khaibulaev. Rio has, however, seen other Russian judokas getting ovations. The 30-year-old Mudranov had been going for gold for two entire Olympic cycles. He was not chosen for the 2012 Olympics, having lost out to Arsen Galstyan, who became champion in London. Mudranov, however, did not give up and has realized his cherished dream. The other Olympic champion in Rio is 22-year-old Khalmurzayev, who was not sure he would be part of the Russian team until the last minute. Competition in Russia in his weight category is extremely high. Russia's success in judo should not come as a surprise to a keen observer. President Vladimir Putin is himself a passionate admirer of the martial arts and is an 8 dan in Judo and 9 dan in Taekwondo. Putin's influence, however, was not enough because Russian judokas had no outstanding achievements to display. A bronze and two silvers in the 2000 Olympics in Sydney and two silvers and three bronzes four years later in Athens did not suit a country with large athletic ambitions. The Russian national team did not pick up any medals at all at the 2008 Games in Beijing. After the failure in China, the Russian national team invited Italian judo expert and 1980 Olympic champion Ezio Gamba to be head coach. Under his coaching, Russian judokas began to shine on the mat and, in just a few years, have won eight Olympic medals, including five gold medals. Isaev, the London 2012 Olympic champion, said Gamba managed to psychologically liberate the athletes. "In terms of technique, the head coach does not interfere in our work. He will only correct or suggest something. The atmosphere changed, the team has become very friendly. When we practice we all help each other," Isaev told RIR. The recent Russian Olympic Judo champions are all from the Caucasian regions, where the martial arts are very popular. "We (in the Caucasus - RIR) have fighting in our blood. Life is a fight and you must always find some kind of competition. From our very childhood we are inculcated (with the thought - RIR)," remarked Isaev. The Russian President, who would attend the judokas' training, had predicted the Russian Caucasian athlete's success half a year before the Olympics. "When I asked who was our greatest competitor in the Olympics many said the Japanese," Putin told journalists. "We have a lot of respect for the Japanese since they are the founders of this sport. Then I asked one of our athletes where he was from, 'I'm a Kabardian,' he said. (Kabardians are a people in the Russian Northern Caucasus - RIR). Kabardians will be better than the Japanese, with all respect," the President said. The judokas say that the head of state's attention for their sport can be felt. "Obviously, Vladimir Vladimirovich has always loved our sport and practiced it in his youth. That is why we meet with him before almost all the big tournaments. We absorb his energy and go forward," explained Isaev. But the success of Russian judo is attributed not so much to the judokas' general sparring with the president but to the significant growth of investment in this sport. "Our national team has everything it needs and no one refuses us anything," Isaev said. Russia's fine achievements at the 2012 Olympics in London resulted in a substantial increase in state funding. From 2013 to 2016 annual expenses for athletes of all levels was raised from 310 to 445 million rubles (from $4.8 to $6.9 million). By 2020, in accordance with the Russian Judo Development Program, funding for the sport will increase up to 508 million rubles ($7.9). There are currently 24 specialist centres that prepare judokas in the country (in 2012 there were only three) and by 2020 their number will grow to 52. Investments are made in the sport and in individuals. 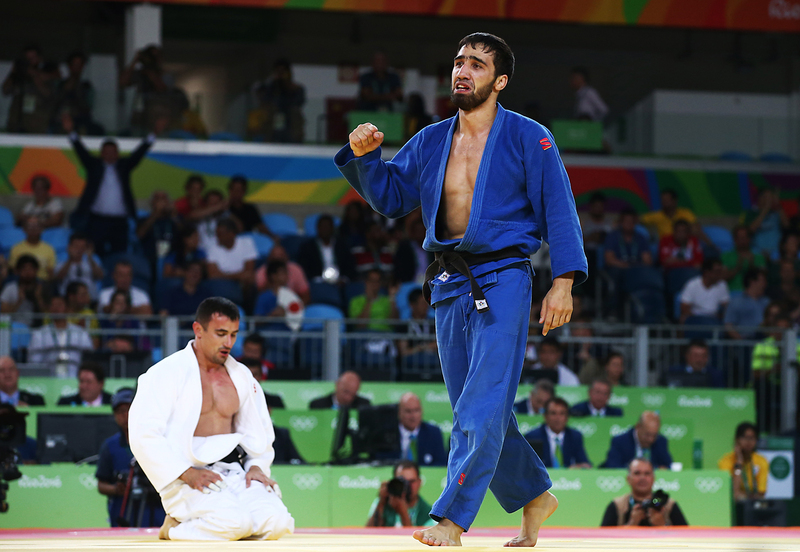 Rio Olympic champion Hasan Khalmurzayev has pledged to donate his 4-million-ruble prize money ($62,500) to the development of children's judo in his native Republic of Ingushetia.